I’ve just finished reading a 1001 nights like tale* set in 11th Century Sicily where the exotic Yasmina beguiles a Norman count in order to spare her condemned brother. As you can imagine it all resolves around the myriad of flavors that are the Sililian table: countless granita and sorbetti of lemons, mandarines and almonds. Beans flavored with wild fennel, tender involtini with the ripest tomatoes, a sweet and sour eggplant caponata with pine nuts and sultanas. Naturally the flavors of Sicily’s Arab population form a cornerstone of la Cucina Siciliana, they dominated the island between the 831 and 1072 and Palermo is closer to Tunis that it is to Rome. So cous cous is not some recent arrival in the Sicilian kitchen, brought by immigrants from Tunisia and Morocco, but an age old ritual where the cous cous is prepared from scratch using a terra-cotta couscousiera and where the smell of the semolina cooking wafted out from kitchens along with the smell of tomatoes and fish of a sort of half soup half stew filled with a variety of fish and shellfish that is eaten with the cous cous. I have only been to Sicily once, back in 2003 with my friend and then business partner Sarah Wilson. We called it a business trip; research and inspiration – in other words we ate quite a lot. 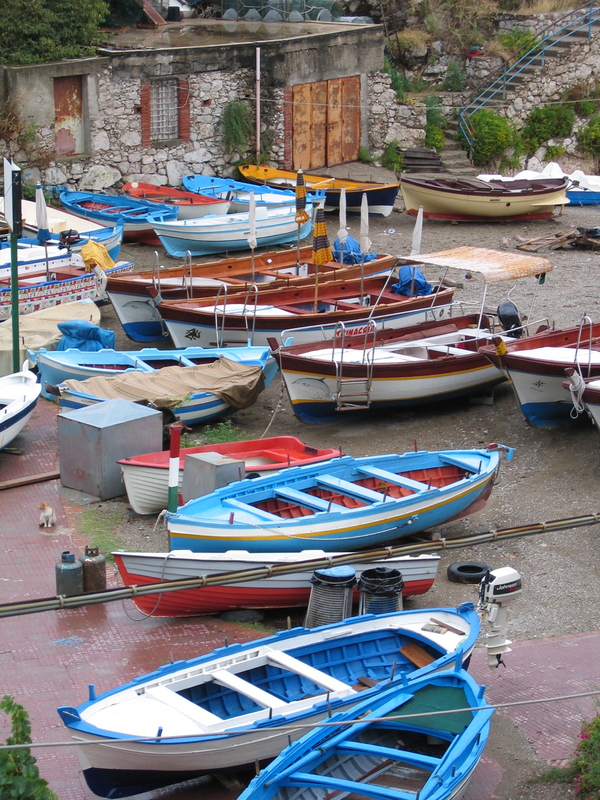 The first photo was taken somewhere near Taormina, so the boats are actually probably more pleasure craft than real fishing boats. Unless they live in the interior, where grain and grapes are grown, where sheep and goats tended, Sicilians are by and large fishermen. Because no fish or part of the fish gets tossed away a seafood soup is one of the ways to use everything, the bones and heads get boiled for a good broth, smaller fish and offcuts are tossed into the soup. I originally found this recipe in Clarissa Hyman’s Sicilian Food and have slightly adapted it over the years. It was recently published in the the very of the sea Great Ocean Quarterly in an article I wrote about Southern Italian Seafood. I have to admit that unlike the good Sicilian mamma, I have never made cous cous from scratch, one day I will, but here I use packet cous cous. Prepare the couscous according to packet directions. The absorption method calls for equal quantities of boiling water or stock to be poured over the couscous (i.e. 2 cups couscous, 2 cups boiling water), then stirred well, covered and left to absorb. Meanwhile fry the onion gently in a little olive oil until soft, add spices and mix with the couscous. Cover and keep in a warm spot while the soup is made. Prepare fish by cleaning and cutting into small 3cm chunks. Shellfish need to be cleaned well and mussels de-bearded. Note that if using clams they should be soaked for at least half an hour to remove sediment. For the fish stock, use a pre-prepared home made stock or a store bought one. If using lots of mussels the cooking juices will be strong and salty and will add a lot of kick to the soup, in this case less fish stock will suffice. In a large saucepan or casserole fry off the onion in a little olive oil until soft and translucent. Add whole garlic cloves and chilli and fry for a further minute before removing garlic and adding tomato paste. Stir well and then slowly add the water and fish stock, mixing diligently so that you have a good clear tomato flavoured broth. Bring the broth to a gentle simmer and then add fish pieces. Cook the shellfish separately in a pan with some white wine, filter juices and then add this liquid and the molluscs to the soup. Season with salt and pepper as necessary. 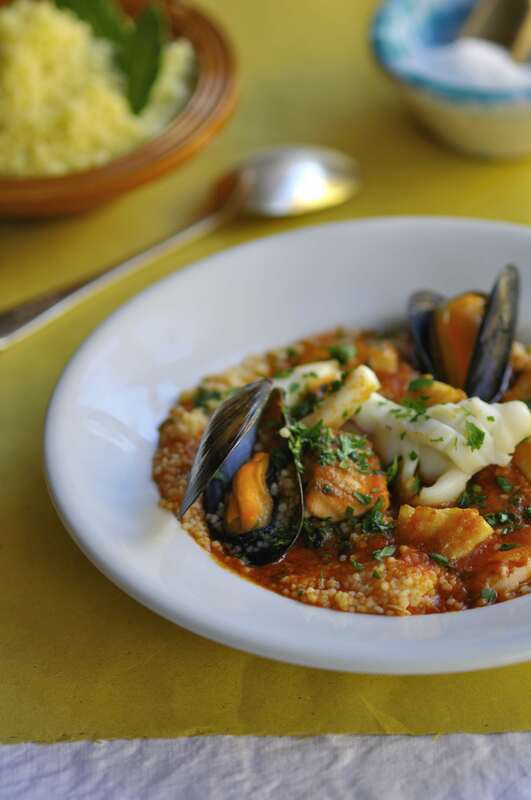 Serve a couple of spoonfuls of couscous into each bowl, ladle soup over the couscous and distribute fish and shellfish evenly between bowls. Sprinkle with chopped parsley and serve immediately.